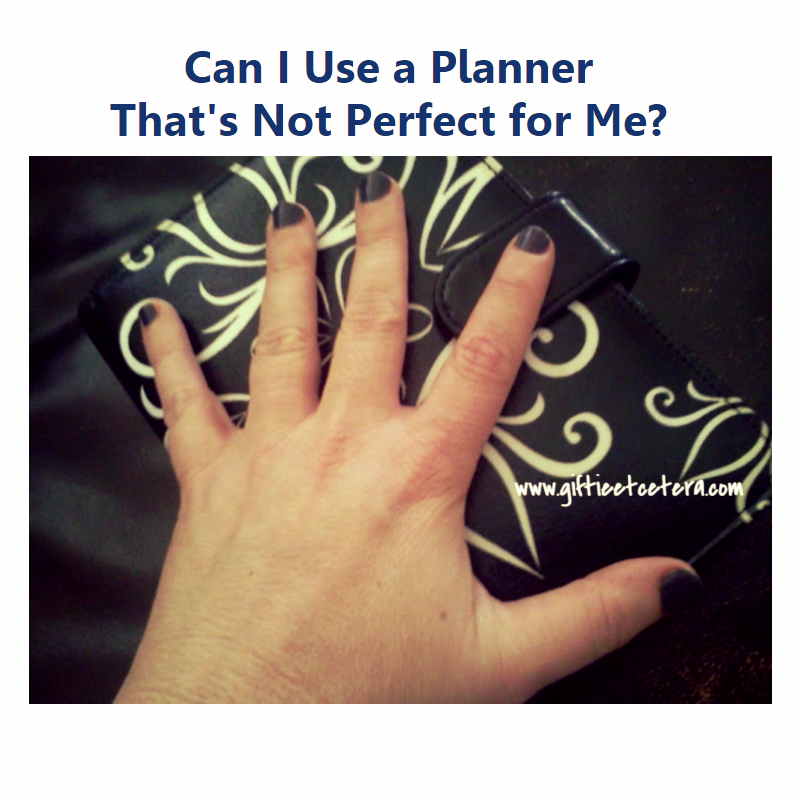 Can I Use a Planner That's Not Perfect For Me? | Giftie Etcetera: Can I Use a Planner That's Not Perfect For Me? I think you can use a planner that is not quite perfect for you. To be fair, I think most of us already do. Everybody dislikes something about their current planner. I don't like that the daily layout I use has such bright blue coloring. But the layout is so good that I overlook that - and use the planner anyway - because I really don't have another option with that fantastic layout. Surely everyone who plans has something like that going on? New planners ask me all the time which planner I recommend. Well, that's a really personal decision. You should consider your needs and your personal tastes. Personally, I say start with a complete, inexpensive system, like a PlanAhead Organizer or a FranklinCovey Compact 365 Planner (both undated for starting anytime, fairly compact for carrying everywhere, and ring-bound, so they are easy to customize). The more you use your planner, the more you will use - and depend on - your planner. The biggest mistake new planner peeps make is to not bring their planner with them. They need to write something down or look something up and it's not there! *Keep a list of what you want to change in your planner. Instead of going out and changing things right away, live with your planner. Learn it. Change what is cheap and easy (like adding a sticky note for a movable list), but just note bigger changes that you want to make on a list. Once you are used to actually using your planner, you'll learn what is worth doing or buying and what isn't. You'll discover if it's worth carrying a bigger planner or if you are someone who needs to move to a small spiral-bound. *Schedule a deadline to reassess your planner needs. I recommend that you use any planner for at least 3 - 6 months to see what you need to customize. If you really can't hold out that long, the need for a change is probably very high, so go ahead and invest in the change. Sure, this is some serious self-promotion. But if you read my blog on a regular basis, I really do give solutions to planner problems all the time. A simple solution might be all that you need to make your planner work for you. You can subscribe to my blog or follow on social media through the links in the right sidebar. I would say there is no perfect planner. Sometimes it's compromising on size you could use for size you can carry. It may be that you need to change size or styles from time to time based on changes in your life. But mostly you can personalize your planner and make it work best for you with a little tweaking. I like having a ring bound planner. Even though it's a little bigger to carry, I'm always wanting to rearrange things and change things, and that makes it easy. I agree with Anna. There is no perfect planner, but with some tweaking, it can come close. Some people need the motivation of decorations, some want or need lines and compartments (that's me), while some need the space to be blank. Some need pre-printed time slots, some plan by context (me again.) What ever works for the way we plan. Then, there's the whole size thing. I am stopping by to let you know that I featured your blog on my Shout Out Saturday blog of August. Some great tips here about using a planner. Thanks for sharing with us at #anythinggoes link up. I agree with all words! It is hard to find a planner that will suit every single need you have and to me, that would be the perfect planner. I love weekly pages because it is easier to see my whole week at a glance, but I prefer daily because there is more room for a to do list. Any suggestion how to make a to do list work and just use weekly planner pages without having to add extra "to do" pages. I would love to have it. Little Angel, write your weekly list in the extra box! I never buy a weekly spread without an extra box. It is early for me to do this, but I already ordered the inserts for three planners; my own, my husband, and our daughter. We did some "windows shopping" at Franklin-Covey and found exactly what works for all three of us. Do our choices work perfectly? Nope! Why did we order them? Because the formats chosen work for us at least 85% of the time. It is not difficult to insert a daily page when one is needed. We already use our monthly tabbed calendars for the "alerts', so details need to go elsewhere, which is the weekly pages. Additional details can go on sticky notes or a daily page. We all like keeping things short, sweet, and to the point. This method works for us. Our planners pretty much go everywhere with us. We feel more confident with the planner at hand and fewer things are forgotten or require a change in scheduling. Our phone and computers back up the planner; not the other way around. I love planners! I have used one for years and keep them every year once I am done with them. They are like little diaries to our lives and I hate getting rid of them. Thank you for linking up to the September Country Fair Blog Party!